The Space Shuttle Discovery on the “Return-To-Flight” mission, STS-114, under the command of Eileen Collins lifts off into hazy skies from Pad 39B at Kennedy Space Center at 10:39 a.m. on 26 July 2005. This is the first flight of a space shuttle since the Columbia disaster in January 2003. The mission will test shuttle in-flight heat shield repair techniques along with resupplying the International Space Station. The images show the roll and pitch-over to put the shuttle in a heads-down position for orbital insertion. 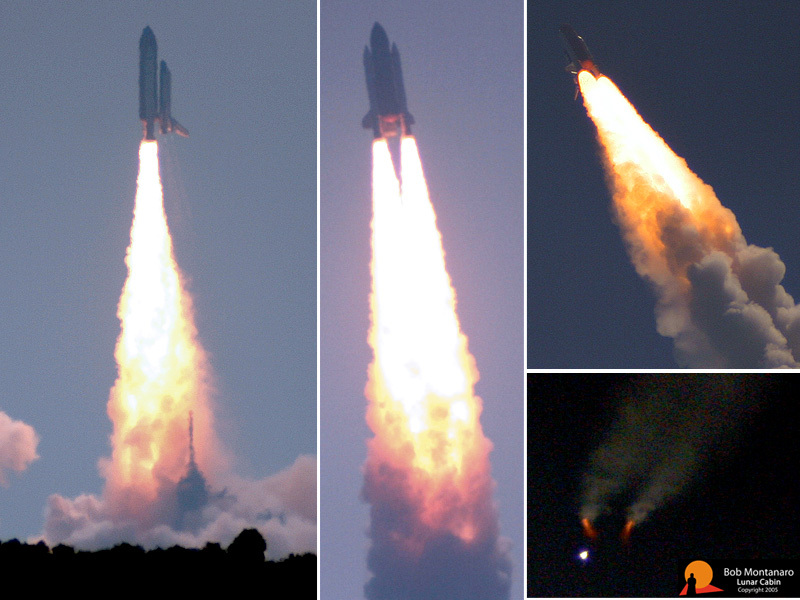 The bottom right image shows the Solid Rocket Boosters falling away.